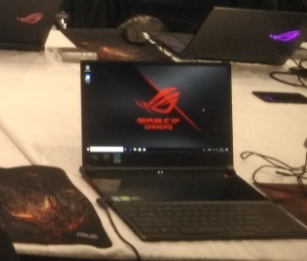 ASUS Republic of Gamers (ROG) has launched the latest range of gaming laptops, ROG Zephyrus S GX531, ROG Zephyrus S GX701, and ROG Strix SCAR II, along with desktop GL12CX. Among these, Asus ROG Zephyrus GX531 is the world's slimmest gaming laptop and comes with high-end features, priced at INR 2,39,990. We would also cover about the above mentioned other laptops and desktop detail, soon. If you are looking for powerful gaming laptop, Asus ROG Zephyrus GX531 key features, technical specification, first impression, unboxing, hands-on, comparison and review etc. then you could find some of them over here. The laptop is powered by Intel Core i7-8750H processor and coupled with 8GB or 16GB RAM onboard (optional). The ROG Zephyrus GX531 comes with NVIDA, GeForce RTX 2070 (Max-Q) for powerful gaming experience. The internal storage of the gadget is of 512GB. Asus ROG Zephyrus GX531 runs on Windows 10 Home operating system and the supplement like GameFirst V, Game Visual and Sonic Studio also arrives with the package. The display size of the laptop is 15.6 inch, Non-glare and Full HD with 1920 x 1080 resolution. The keyboard of the device has enough features specially dedicated to gameplay format, like it comes with backlit chiclet, RGB 4 zones and ROG Armoury Crate etc. This could be one of the best gaming laptop in 2019 for sure and RTX will enrich even more. The end user can get 1 year warranty as well. Please find its specs and price detail below. Tips: Most features packed gaming laptop to enjoy gameplay.